Quick Way to Fail? Enterprise Architecture on Excel. 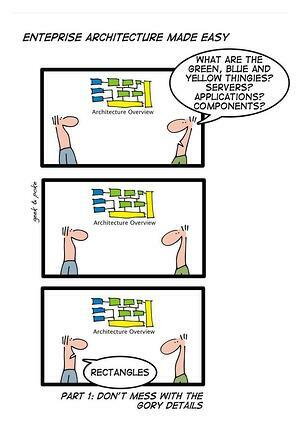 Being an Enterprise Architect isn’t easy. People expect you to literally map out the company’s entire existence, connect it the future, and somehow fit it all into a neat little map. You’re expected to connect dots where no one has seen a connection. You stretch lines over trenches and trenches of charts and diagrams to make a full picture out of the inner workings of your company. From that picture, the business makes a future plan. The role of an Enterprise Architect (EA) is a thankless endeavor, you’re often charged with the task of mapping the unmappable, charting the unchartable, and visualizing the past, present, and future of an entire organization in one A1 size poster. For those who do not know, EA links the business mission, strategy, and processes to an organization’s IT strategy. In doing so, EAs use multiple architectural models or views that document how the structure is currently set up and shows how the current and future needs of an organization will be met in an efficient, sustainable, agile, and adaptable manner. By design, EAs are required to invest a substantial amount of time documenting information and collecting hordes of data, often just for the sake of collecting it. After amassing the data, EAs of the past would use this aging data to generate a 5-year plan for the enterprise. After expelling all of their mapping juices, the downtrodden, tired EAs would disappear back to their desks, take a much-needed break, and begin the cumbersome process again for the next 5-year report. Just this process of amassing hordes of data is innately complex and incredibly time-consuming. Now imagine carrying out all of these tasks with subpar tools. We all love Excel. I do. From years of attending intensive college courses, navigating Microsoft Suite and Excel was one of the few worthwhile takeaways. I’ve used Excel to track billable hours, budget monthly spending, and save up for a big purchase. More creative (and bored) users have used Excel to make pixel art on a slow day at work. Excel can also be used for a number of high-level tasks, including storing, organizing and manipulating large data sets. Although Excel can be an integral part of carrying out business requirements for your company, unfortunately, Excel is no place for Enterprise Architecture. 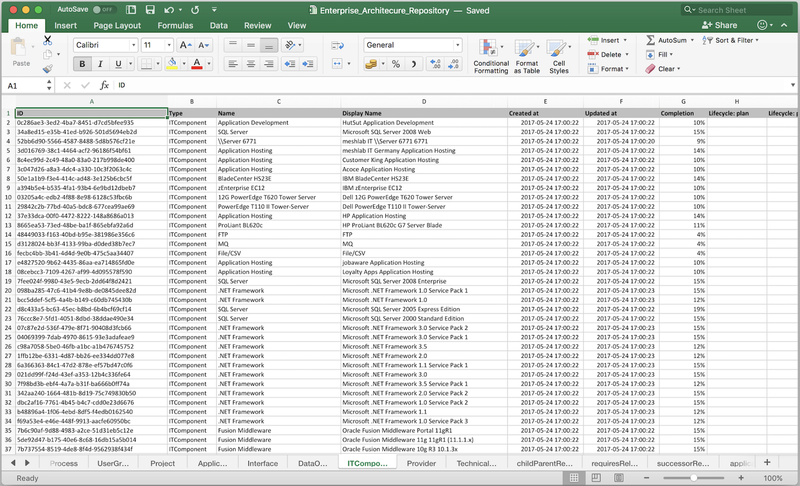 Excel EA is not OK.
What Enterprise Architecture looks like on an Excel Spreadsheet. Confusing. LeanIX research shows that large enterprises with more than 1 billion Euro in revenue use an average of 650 applications simultaneously. The 10% largest enterprises have upwards of 3400 applications deployed at one time. Excel can do many things, but making sense of 3400 applications and their prospective lifecycles, dependencies, costly redundancies, and possible risk is simply impossible. Selling the Value of EA. 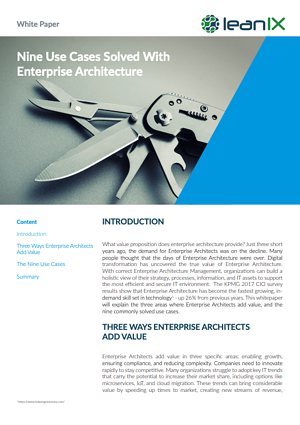 So how does one sell the value of Enterprise Architecture? How to prove how much EA endeavors are worth in terms of value, price, and bottom line savings? If you wanted to demonstrate to the appropriate stakeholders how a certain application will have an impending support gap in their life cycle that will subject the organization’s IT infrastructure to immeasurable amounts of risk, surely leading them through a treacherous 20-page spreadsheet won’t get your point across. So why do Enterprise Architects use the MS Office approach? 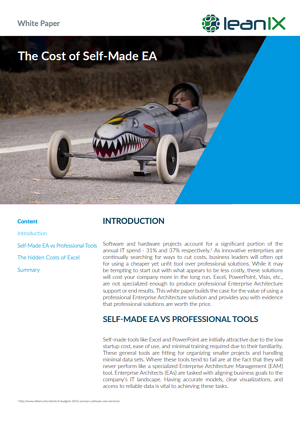 Tools like Excel, PowerPoint, Word, and Visio are often thrown together to create a makeshift Enterprise Architecture portfolio. These tools are familiar, most organizations already have a license, and the learning curve is virtually non-existent — we’ve been using Word and Excel since Bill Gates announced the first Microsoft Suite in August of 1988. Unfortunately, managing these four programs to create a presentable Enterprise Architecture view can quickly turn into chaos. These programs cannot connect certain data and create certain viewpoints. In the MS Office approach to EA, it is impossible to tell which applications being used in the satellite European offices are producing redundant data. One glance at an Excel spreadsheet won’t show you how well your application portfolio is adhering to security standards. You won’t be able to gather any pertinent information without digging deeply into spreadsheets, duplicating them numerous times, pouring over them, and inspecting them with a protractor and magnifying glass. 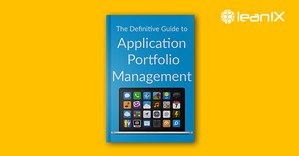 It’s close to impossible to connect 300 applications — let alone 3400 — to their supporting business capabilities, track their lifecycle, take note of their business relevance, and make a plan to decommission all lower-performing and unnecessary applications through a spreadsheet. Even if you get a system down to use the messy assortment of Excel, Visio, Word, and PowerPoint, these programs still cannot talk to each other, update or respond to changes in the one another, and their formats are simply incompatible. Each program remains in isolation, which requires the EA to manually update any changes from the IT landscape to Excel, to the corresponding information in Word, alter or make a new slide in PowerPoint, and draw a new diagram in Visio. Good thing changes only happen once every few months, right? Digital transformation is changing our IT landscape quicker than you can say TOGAF. Studies show that the 20 largest vendors alone have over 1 million technology products with 2,500 changes per day. Those changes could be relevant to important business decisions in your IT landscape. If your company’s architecture is maintained by one person, he or she will be frantically bouncing from sheet to slide, slide to Visio sheet, repeatedly pressing CTRL + F to find the information to update the corresponding Word documents. If your organization’s architecture is maintained by more than one person, assume total chaos. No matter how competent your workers undoubtedly are, human error will rear its persistent head and ruin just one simple line in one sheet, leading to errors in cost, lifecycles, and application IDs that don’t reconcile anymore. EA Sharon reports that the widely used HR app will no longer be supported by the development team from November 2017 on, but EA Bob mistakenly enters November 2018 onto page 58 of the application lifecycle spreadsheet. Naturally, your organization continues using the unsupported software in their 48 offices for an entire year. Hackers find and exploit bugs to access the organization’s data network, compromise pertinent files, copy all of the end-users information, and demand a $1 million ransom in bitcoin to restore the data. Ok, that outcome is a tad bit extreme. Nevertheless, if your organization uses more than 10 applications, staying abreast of the changes while using MS Office will prove difficult. Any businesses looking to expand will simply outgrow Excel. When you plan to build a house, you use the correct tools. Imagine if your contractors showed up with only a toothpick, a fork, a trebuchet, and a 10-foot rope to the land lot. You would send them home and hire a company who has a crane, a chop saw, a nail gun, a cement mixer, and a host of other appropriate devices to build a house. 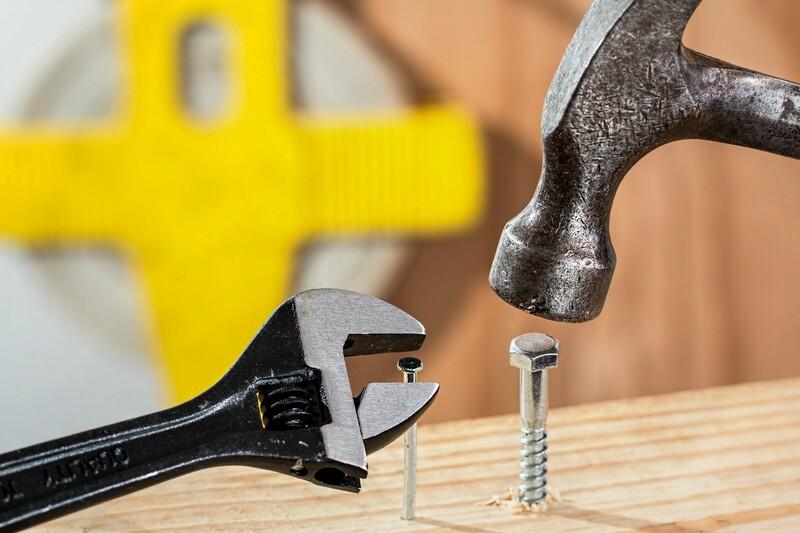 When you plan to architect the future of a company, why use unfit tools? Use an Enterprise Architecture Management dashboard. Consider using an Enterprise Architecture Management tool specifically designed for EA reporting. There are a number of tools on the market that plainly display everything an Enterprise Architect or CIO needs to know. It’s best to start out using these tools sooner than later. Sharon and Bob will be eternally grateful. 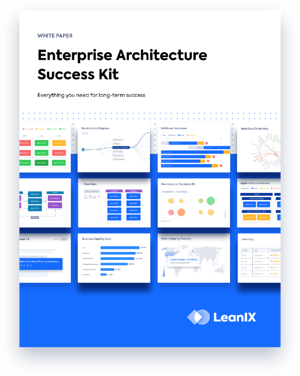 The LeanIX dashboard shows all key Enterprise Architecture views that are important for every organization. The Excel dashboard shows…well, a bunch of numbers.